NAREP- President, Elias Chipimo says the constitution is not a priority among many Zambians especially in rural areas. Mr. Chipimo says Zambians in rural areas can not put the need for a new constitution on five top priorities. He says in as much as NAREP wants a new constitution, stakeholders have not put the matter as an election issue in all parts of the country. Mr. Chipimo says NAREP has since backed Justice Minister Ngosa Simbyakula’s stance to amend some sections and subject contentious clauses to a referendum. Meanwhile, Mr. Chipimo says he will now engage President Edgar Lungu to share ideas on ending the challenges facing Zambians. Mr. Chipimo says it is not correct for the opposition to think that they will only implement their ideas when they get in power because Zambians want immediate solutions to their problems. And Mr. Chipimo says the trend of having a party leader for many years should be discouraged in order to promote a new wave of democracy. He says he will therefore allow any capable members of NAREP to challenge him at a national convention. 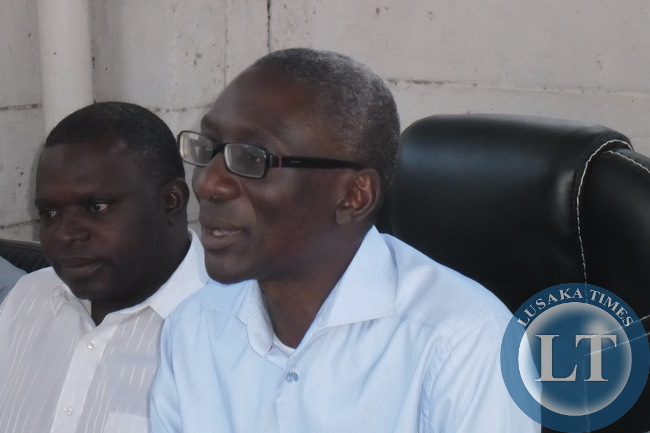 Mr. CHIPIMO was speaking at a media briefing in Lusaka on Wednesday. Walanda bwino.After ka chagwa am seriously considering ka chipimo. Chipimo You are forgiven and forgotten. You are neither here nor there in Zambian Politics. Infact you belong to the category of Muliokela and Cosmo Mumba. Each time I have said what Chipimo has said, I have been greeted by insults. The opposition – and the not-so-Grand Coalition, think that a new Constitution guarantees them victory – wrong!!! We have wasted a lot of money on the “New Constitution” song and got nothing. Kaunda lost – on the old constitution, Chiluba’s third term bid failed – on the old constitution, RB lost on the old constitution, we have carried out two democratically successful presidential transitions after tragedies – on the old constitution. Why should it be difficult to make amendments to improve the old Constitution through the people we elect to represent us? Like it or not, we elected them as our representatives. Technical Committees, Committees of Experts have all yielded nothing. This is the problem when people do not understand what is at play…we need constitution to grow our democracy (reduce the power of the executive and maybe corruption), ensure that MPs do not go rogue once in parliament like Siamunene, reform the judiciary…stop rubbish going on with DPP, and many areas we have seen the constitution is lacking. Chipimo is right. That’s why I always say Zambians are blessed and endowed with stupiditty and docility. The don’t know what’s good for them. It only takes chibuku, a few pieces of silver, stup!d excitement to hoodwink them. Lousy leaders, lousy pipo, lousy everything. What a country! The one who is lousy is you because any intellegent person will know Refrendum cannot work in Zambia. Chipimo is realistic unlike others who condemn everything the govt dies. Today they even condemned fuel increase yet they know the reasons. THIS IS ONE THING I LIKE ABOUT CHIPIMO. HE IS DOWN TO EARTH AND REALISTIC. PEOPLE IN RURAL AREAS WANT ECONOMIC PROBLEMS SOLVED. NOT A CONSTITUTION TO LET CROOKS IN POWER OR TO HAVE DUAL CITIZENSHIP. WHAT IS 50+1 TO YOUR UNCLE/AUNT AND GRANPA/MA IN RURAL ZAMBIA? EQUALLY, WHAT IS DUAL CITIZENSHIP (OR EATING WITH BOTH HAND, IN BETTER LANGUAGE) TO THEM? THE PEOPLE OF ZAMBIA NEED DUAL CARRIAGE WAYS AND NOT DUAL CITIZENSHIP. HOW DOES DUAL CITIZENSHIP AFFECT THEM? IN FACT IT IS JUST A FLOOD-GATE FOR ALL SORTS OF CROOKS COMING TO ZAMBIA AND GETTING THE LITTLE THERE IS. WHICH WILL INVITE XENOPHOBIA IN ZAMBIA. Hahaha you are saying dual citizenship will create a floodgate of crooks, it is already a floodgate of Chinese and other foreigners getting everything they could out of Zambia, including owls that they hunt in the night. The problem is black people never support each other and that is why we usually find ourselves at the bottom in everything. For you all u think of about dual citizenship is eating with two hands and not the benefits that it can bring to the country. Shame!!! So why do we vote? We can as well have a president for life…right! Independence was not among the priority of many zambians prior to 1964 especially in rural areas but the learned and courages zambians who envisioned a free country championed that cause.Today as claimed by chipimo it might be true but some learned zambians who have seen the abuse of power by president and loopholes in our treasury and who envisioned our grandkids for a better zambia should champion the cause for a pipo driven constitution. Agreed. But the problem is that most of the learned people see political interest before national interest. It baffles me that they spent a lot of money on drafting this constitution and abandon I just like that. And people are okay with that. The notion of majority citizens does nt mean they are right.it was only 55 men who sat tirelessly and formulated one of the best constitution in the world(usa).Today america is one of the best economic opportune country.chipimo ‘s brain is in osmosis stage. Chipimo, why do you hide behind your party when at heart you are PF, you should not be opposition because you are always agreeing withem. There is money enough for by elections but no money for a referendum. why must a few people sanction in parliament the constitution? we the Zambian people want a PEOPLE DRIVEN CONSTITUTION as promised by the late president Sata. This is actually an insult to people in the rural areas (& by extension to all people). People in those areas know what they want & you Mr educated chipimo are supposed to help them understand how good governance helps them attain what they want. Saying a good constitution is not their priority is like saying they are that dull. Please spare my mother, she wants a constitution that will empower her to demand service from her local councillor. After all that councillor was elected by her. Mr Chipimo you can support ECL without insulting other people. Chip I’m needs to just come out and join PF than tell us such nonsense. This guy Chipimo is walking dead. The people in the rural areas need guidance. This is being an educated f**l. If old Chipimo was arrive, he would have disowned this sick boy. May be it is pay back for the help the PF mafias gave the guy during the funeral of his father. Never get help form RB or PF because you will be made to eat your vomit. Dear peace loving Zambians. I wish to warn that DEVIL starts from far yet target may be you or us to break. The plans ,thoughts and activities of antagonising government by all weather personalities and parties presidents need not taken light but strongly. the ideas to fan confusions in the system orderliness may be driven by selfish desire to free oneselves from jaws of law due to many heinous activities undertaken or desire to be in statehouse. At the moment ,no need to get the country into unnecessay confusions. Let all peace loving Zambians raise to condemn ill acts from any corner. We should not be used for battles we may not know. Lets give way to peaceful governance. Evil politiquing is devlish and only devil hates peace but loves confusion. We must look out . Elias Chipimo is all over. What ideas did he share with late president Sata and was ignored? that he now wants to share with president E Lungu? Chipimo is fast becoming irrelevant to Zambian politics. Who is going to listen to your ideas when other political leaders proposed profound workable ideas and the response was ME TOO. PF E Lungu became/ is mr ME TOO. I propose Chipimo should merge Narep with PF for his ideas to be taken as paragon, paragirised and fused into PF manifesto. Is this guy serious??.. a new constitution is a priority, without it, these people will keep abusing the powers that are there. I guess I was wrong to put Mr Chipimo on the same level as Nawakwi and HH. It looks like only HH and Nawakwi are consistent, wise and have unwavering character. Mr Chipimo, that’s called sucking up. You and Fr Bwalya are no different after all. This makes the new constitution number one priority! Yes some people criticise everything govt. does even when govt. mean well. These are actually politicians we can never vote for. What I know is that an empty vessel makes the loudest noise. I urge all peace loving zambians to ignore such ambitious people who make such noise in the name of making checks and balances.